Daredevil Meets Jessica Jones in New Defenders Set Photos! 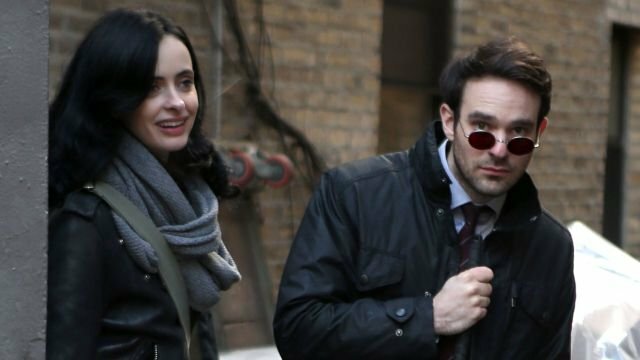 Daredevil Meets Jessica Jones in New Marvel’s The Defenders Set Photos! Production continues on the upcoming Marvel’s The Defenders and while some of the show’s core cast members have been spotted with other characters, we now have photos of some of the key players coming together to film a scene. Below, you’ll find photos featuring Krysten Ritter’s Jessica Jones filming a scene with none other than the devil of Hell’s Kitchen, Charlie Cox as Matt Murdock! In addition, you’ll find photos of Finn Jones as Danny Rand/Iron Fist with Jessica Henwick as Colleen Wing, and seemingly Mike Colter’s Luke Cage spying on them. Check them all out below and keep an eye out for a special Easter Egg in one of the photos! The Marvel series also stars Elden Henson as Foggy Nelson along with Deborah Ann Woll as Karen Page, Eka Darville as Malcolm, Carrie-Anne Moss as Jeri Hogarth, Scott Glenn as Stick, Rachael Taylor as Trish Walker, Simone Missick as Misty Knight, Elodie Yung as Elektra, and Rosario Dawson as Claire Temple. It has been hinted that Jon Bernthal’s The Punisher will return for the series as well, but that remains unconfirmed.